Inspired by 20th century art-deco styling, the Waldorf range from Crosswater combines classic square lines with elegant soft edges to produce a luxury and striking look that is suitable for both contemporary and traditional settings. Complement your Waldorf bath and basin brassware with matching shower valves. Crosswater has an unrivalled collection of shower valves to provide you with the ultimate in performance. Choose a highly efficient multi outlet experience or an versatile yet simple, single shower outlet. 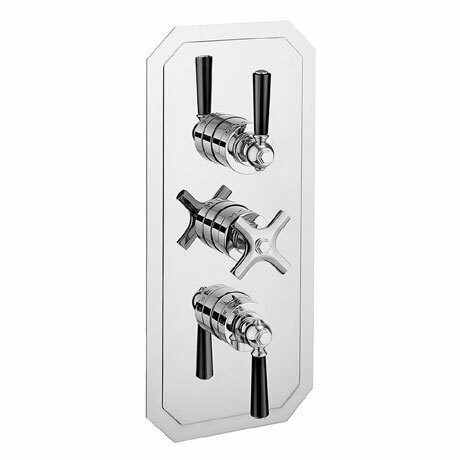 Whichever your preference, all designs are brilliantly engineered to suit British plumbing systems. This valve features three flow controls and allows you to use two outlets separately or at the same time. Operate a bath with shower, or with two shower outlets.